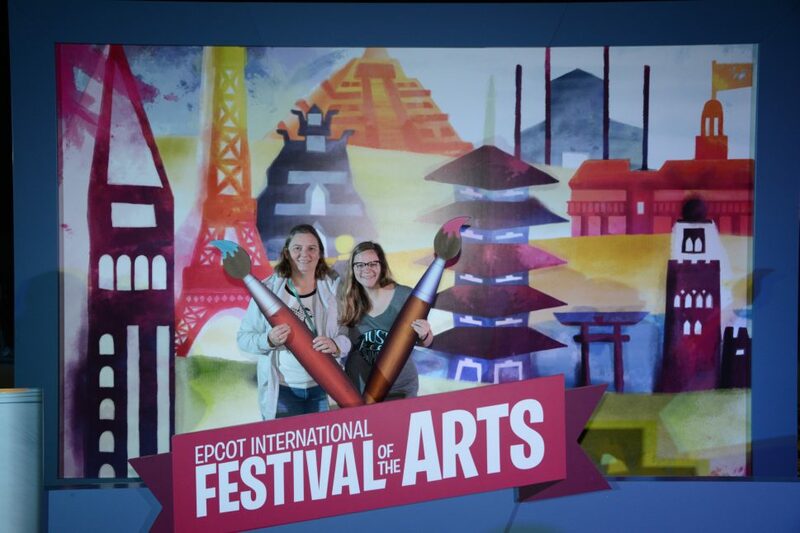 The Epcot International Festival of the Arts made its debut in 2017 at WDW from Jan 13-Feb 20, and it had a lot in store for guests to enjoy! Everything from food to entertainment to interactive displays had an artsy touch and we’ve got the scoop on why we hope this festival keeps coming back to Epcot year after year! The Epcot International Festival of the Arts is a great addition to the WDW festival lineup! Photo courtesy of Leah Sikes. Today we’re joined by guest blogger Leah Sikes, who had the chance to take in everything the festival had to offer! Take it away, Leah! 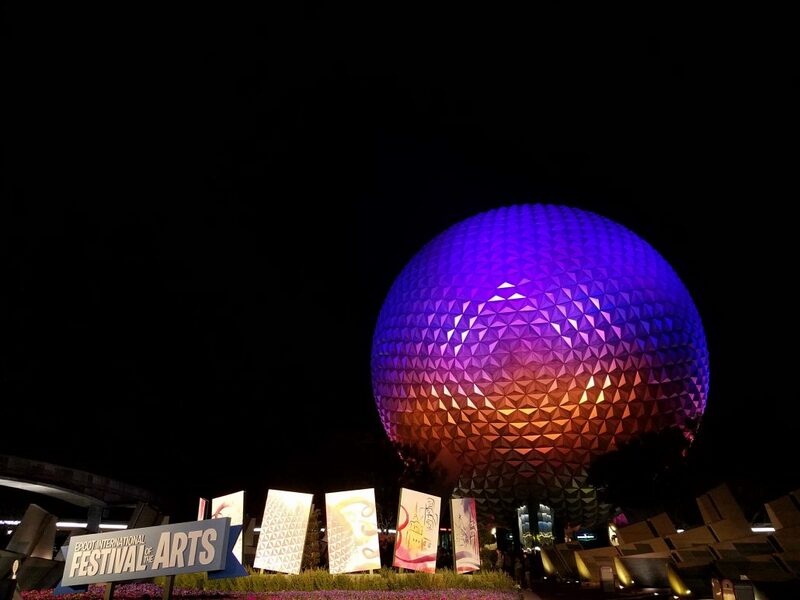 This year, Epcot launched their newest weekend extravaganza: the International Festival of the Arts, January 13 through February 20, running Fridays-Mondays. 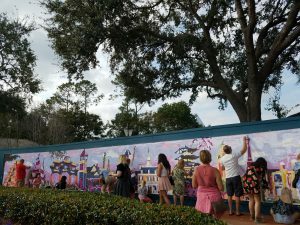 I was lucky enough to have a trip to WDW planned right in the midst of the happenings. The festival blended together all facets of the arts: culinary, traditional, performance and graphic. The event offered enough shows, seminars, shopping and snacks to give you a full day or two at Epcot – but since I don’t get to visit that often, I had to balance riding Soarin’ on repeat, meeting Sadness and taking in the festival. 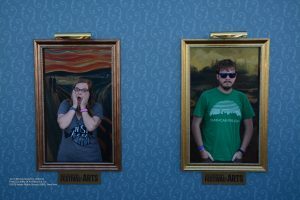 Despite this, I feel happy with my experience at Epcot and I am ecstatic I was able to be a part of their inaugural year. Showing off our artistic side! Photo courtesy of Leah Sikes. Our first Epcot day was Friday – they offered a handy time guide at most of the shops, though I had to ask around a bit to figure out where some of the different events were happening or how long they lasted. I wanted to go to everything, but I had to pick and choose and also account for what the rest of my group wanted to do (traveling with seven adults is tricky, guys). 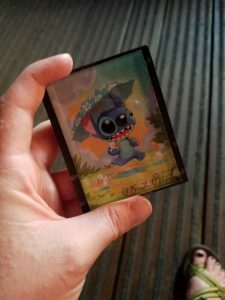 This Stitch magnet was signed by the original artist! Photo courtesy of Leah Sikes. 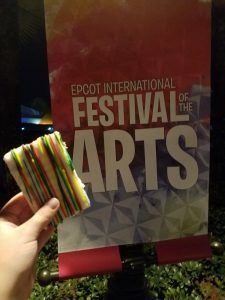 This Pop’Tart was one of the many snacks available at the festival – filled with hazelnut spread, it was a clear winner! Photo courtesy of Leah Sikes. They offered drawing classes with a real actually-employed Disney artist, regular shows on various stages around the World Showcase, booths featuring Disney-commissioned artists (some of the artists were even available to sign their work), creative drink and food booths, a Disney on Broadway selections show, and so much more. 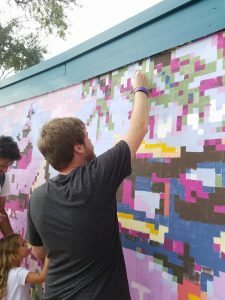 This larger than life paint by numbers activity was a hit! Photo courtesy of Leah Sikes. What a beautiful creation! Photo courtesy of Leah Sikes. Several seminars were offered daily, with different focuses – I attended two of these. * The first one was only mediocre (the speaker was visibly terrified, understandably, and was a little underprepared). However, I stuck it out and still went to the second one of the day and it did not disappoint – hearing Brett Owens, Senior Graphic Designer, Walt Disney Parks & Resorts Creative Entertainment ended up being one of my favorite activities (the fact that I am a graphic designer myself probably had nothing to do with this…). He was a phenomenal speaker, and though he only had thirty minutes on the floor, he packed a punch into the time he was given, speaking about his process in digital illustration and some of the projects he’s done for the Disney Company. 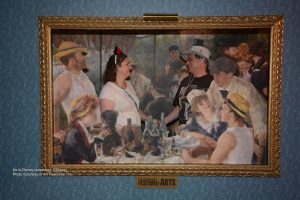 Interactive “painting” photo opportunities – so much fun! Photo courtesy of Leah Sikes. Even if you don’t want to participate in the extras the festival has to offer, you can still experience it throughout the World Showcase in the fun photo opportunities, the portraits at several princess meeting spots or the living statues in front of the fountain stage. I hope Disney considered this event a success and it becomes a staple event for Epcot – I for one would certainly would plan a trip around it. 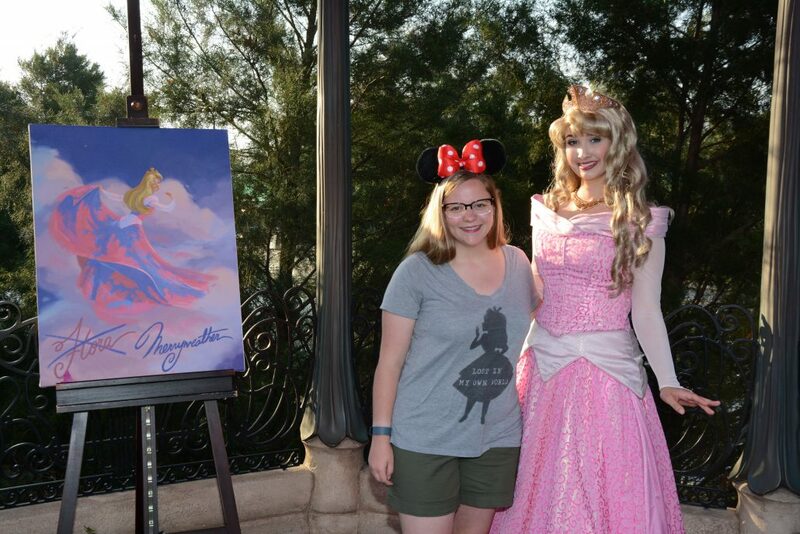 Meeting Princess Aurora – beside a painting of her infamous color changing dress! Photo courtesy of Leah Sikes. *Be aware, some of the seminars and classes require pre-registration and a fee, though most are free to attend. 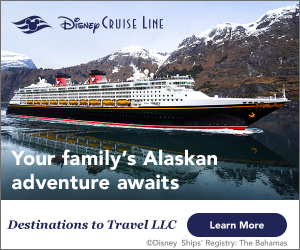 Check up on the Disney website for the schedule if there’s something you really want to go to. Even though the Festival of the Arts is coming to a close, there’s no end to the fun – The Epcot International Flower and Garden Festival is about to begin! For more on the festival – and one of the most beautiful times of year to visit Epcot – check out our March issue by clicking here!